This catalogue accompanied an exhibition of the same name at the North Carolina Museum of Art in Raleigh from October 31-December 5, 1976. Rather than a book, this catalogue takes the form of a folder containing looseleaf photocopy reproductions of the mail art and correspondence that was shown in the exhibition. The exhibition was organized by mail artist and longtime correspondent and friend of Ray Johnson, Richard Craven. According to Craven, Johnson was so pleased when he first saw this catalogue that he fell to his knees in gratitude. 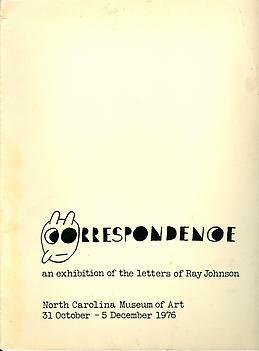 The catalogue includes the short essay "Ray Johnson: The Comedian as the Letter" by William S. Wilson as well as an introduction by Moussa M. Domit, Director of the North Carolina Museum of Art. Craven, Richard, ed. Correspondence: An Exhibition of the Letters of Ray Johnson. Raleigh, NC: North Carolina Museum of Art, 1976.